iskn has the confidence of CM-CIC Innovation and iXO Private Equity and raises €10.5 million to fund the roll-out of its Augmented Interaction technology. CM CIC and iXO PE join forces with iskn, jumping head first into the world of Augmented Interaction, and along with Partech, C4 Ventures and Supernova Invest, investing €10.5 million to fund the international development and diversification strategy adopted by this young Grenoble-based start-up. Following the launch of its first product, the Slate, which combines the feel and sensation of paper and pencil with the magic of digital technology, iskn now aims to make its technology a benchmark in the world of Augmented Interaction. It all began in 2011, when we were «convinced that we were at the dawn of a paradigm shift where the physical and digital worlds would merge into one, a world in which the richness of our interaction with the digital world would be key...» explains Jean-Luc Vallejo, iskn’CEO. Thus, was launched the Magma (Magnetic matrix) project. Iskn came naturally about three years later, in 2014, with the goal of “enriching the experience of interacting with the digital world” and a desire to increase the value of day-to-day objects from a digital perspective simply by enabling them to interact with the digital world. Thus, was born the concept of Augmented Interaction. The technology developed by iskn, which holds 20 families of patents, consists of a surface made up of a network of sensors that spatially identifies and locates a magnet in real time using the 3 dimensions (X, Y and Z), meaning that any object can be fitted with a simple magnet to allow it to interact with the surface and therefore with the digital world - a smart surface that increases the value of objects from a digital perspective in terms of their use. “We talk about ‘Augmented Interaction’ because our technology revolutionizes the mutual dependence between man and the digital sphere”, insists Jean-Luc Vallejo. Having funded the company’s first steps through a 2013 crowdfunding initiative, iskn would really take off a few months later in October 2014 with an initial round of financing, amounting to some €1.5 million (Partech, CEA-I, Kima Ventures and C4 Ventures). Jean-Luc Vallejo adds finally: “Since 2014, our strategy has primarily involved controlling our growth and structuring the company with a view to making the transition to an industrial scale. This second round of financing, amounting to €10.5 million, will give us the means we need to achieve our goals, namely to accelerate our international development, diversify our activities, launch new products and make the iskn technology the world’s leading technology in the world of Augmented Interaction”. While a number of new developments are expected to emerge within the Grenoble-based start-up in September, we will have to wait until 2019 to discover its new range of products, which will place particular emphasis on learning and entertainment. With no fewer than 3 product launches planned for the first quarter, iskn is set to make 2019 a pivotal year in its development. C4 Ventures is a leading European venture fund founded by Pascal Cagni (VP & GM Apple EMEIA 2000-2012). sectors: the Future of Commerce, Smart hardware and Digital Media. Thanks to their operational expertise and a team of Operating partners, C4 Ventures is best positioned to help entrepreneurs accelerate their business in the complex European landscape. all began in 2010 at the CEA-Le in Grenoble. The three future founders of iskn - Tristan Hautson, Jean-Luc Vallejo and Timothée Jobert - met in the open innovation laboratory of this world-renowned institute operating in the field of micro and nano-technologies. Together they would come up with various ways of using everyday objects to interact naturally with the digital world, each bringing their own complementary skill sets (engineering, marketing and user experience) to the table. 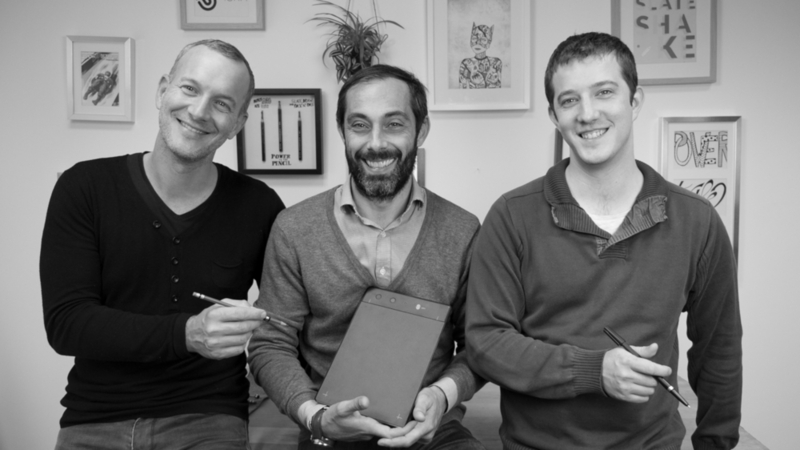 Launched in October 2015 with its first app, Imagink, the first product developed by start-up iskn, the Slate, has already won so many users with the until now unheard of promise of creating an immediate digital version of designs originally created on paper.